I hope my model friends get to see this! PMAP or Professional Models Association of the Philippines is such a big deal in the industry that almost every model I know wants to be in it. True to form, they've launched some of the most illustrious careers, whether domestic or international, plus the current Ms. Universe Philippines 2016. 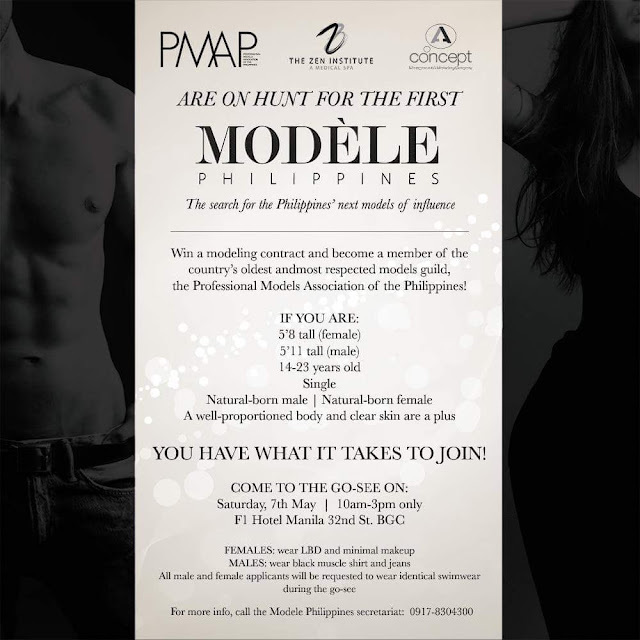 So to say, they're the best there is in the industry and now they're looking for new models of influence in a search called "MODÈLE PHILIPPINES". The GO-SEE will be held this Saturday, May 7th at the F1 Hotel in BGC. Female models are required to wear little black dresses, minimal makeup whilst the men are required to wear black muscle shirts and jeans. You will also be required to wear swimwear for the go-see. If you see this apt for you, go ahead and contact them through 09178304300. I'll also be there to cover so you better be ready!